DOWN CAME ALL THE RAIN AND FILLED UP ALL THE DAMS. Some months ago we went to Wivenhoe Dam for a picnic with friends. 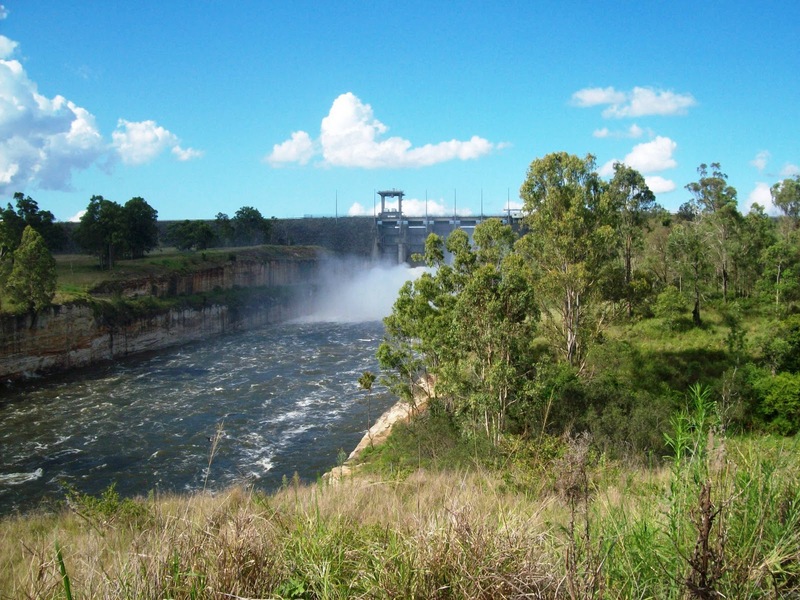 It was good to see a lot of water in the dam compared to the earlier years of drought. However it still wasn't full. The five gates were still firmly shut. We have had a lot of rain recently and the dam has filled to capacity. So one gate has been opened. It is a novelty for us to see this after being in drought for many years, so people make a trip out to see the sight. 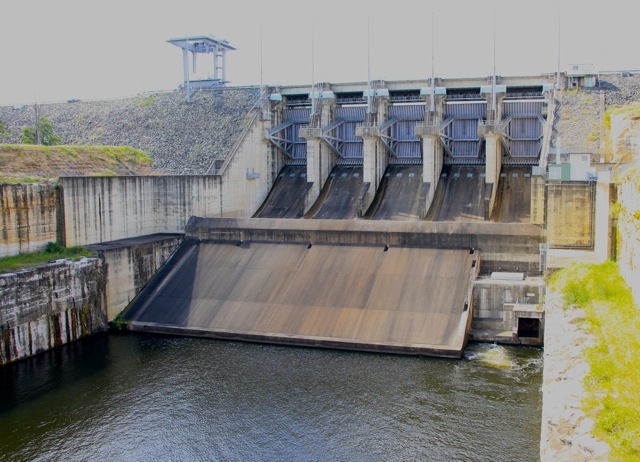 I haven't been but my friend, Ann, who is a regular reader of my blog, saw that I mentioned the dams the other day and sent me these photos of when she and George visited the dam last week. One gate was opened and the spray soaked everybody at the lookout. 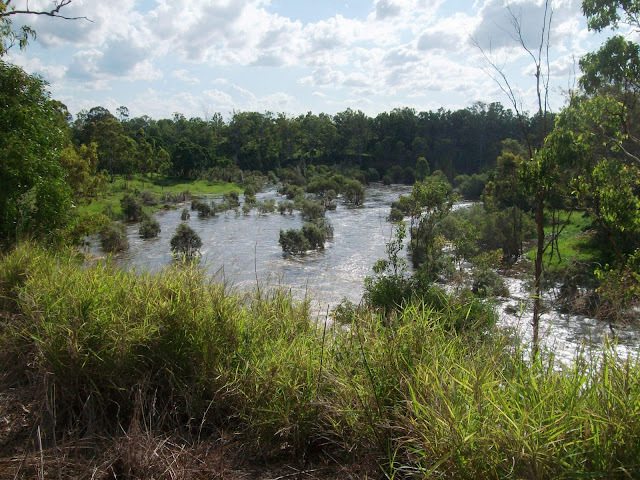 See how it floods the Brisbane River in town on Cara's blog here. 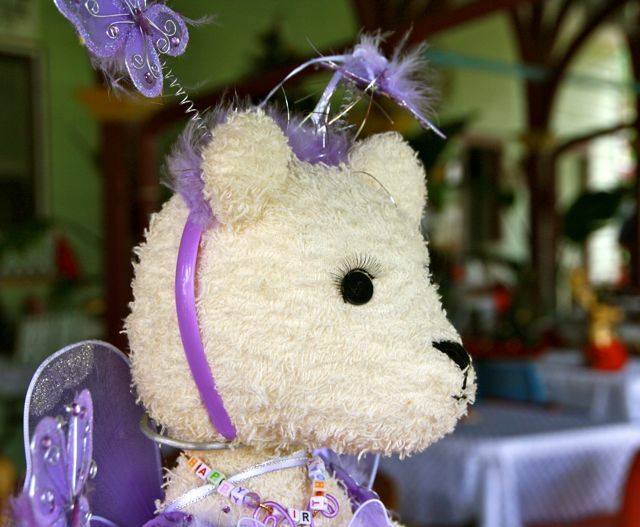 We are very happy to be attending a wedding on 28th Dec. Very happy because our daughter and partner Bernie are getting married. "OK" magazine did an article on the engagement. This happened a few months ago. Bill did a post with this article so if you have seen it sorry to bore you. Click on the pic once and then click again and you can read the article. This is how Bernie proposed. 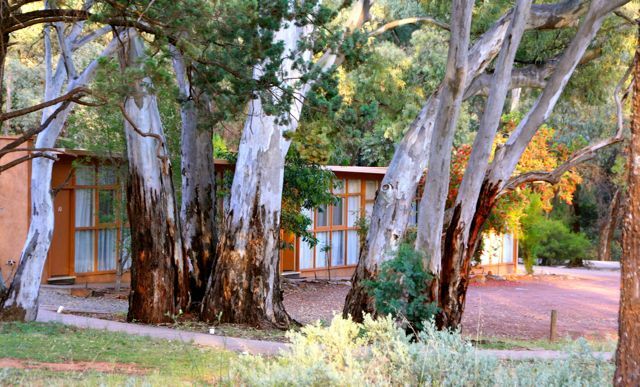 The Wedding will be held in the garden of Bernie's parents holiday house at Rye on the Mornington Peninsular south of Melbourne in Victoria. We fly down on Boxing Day for four days. I'm getting excited. RAIN,RAIN, GO AWAY. COME AGAIN ANOTHER DAY. 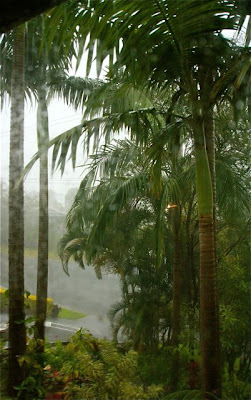 We have been having rain and tropical storms everyday this week. For weeks now we have been having lots of rain. 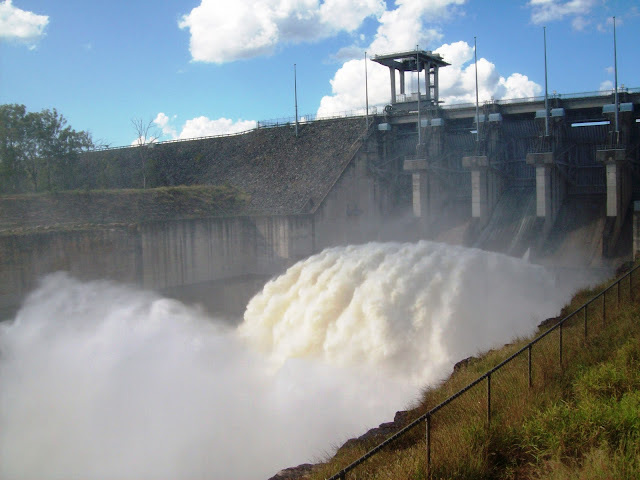 All our dams are full and water has to be released so that they don't overfill. This is such a stark contrast to a year ago when Brisbane was running out of water and our dams were down to 15%.The government built a desalination plant for millions of dollars and now it is in mothballs. We are all growing webs between our toes and fungus on our skin. 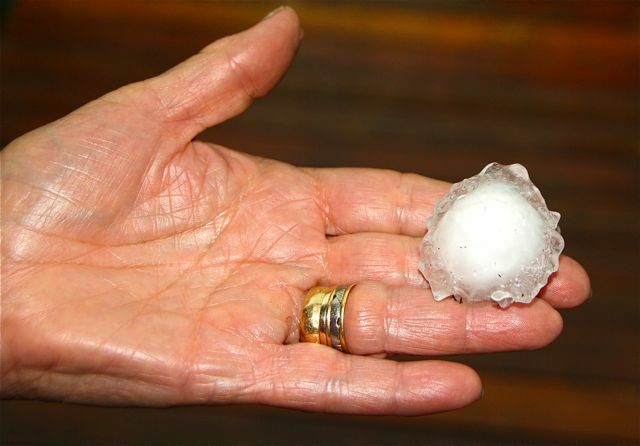 A few days ago we had a hail storm which caused a lot of damage in nearby suburbs but we were lucky and escaped damage. It was a very hot day and the hail was melting as soon as it hit the ground. 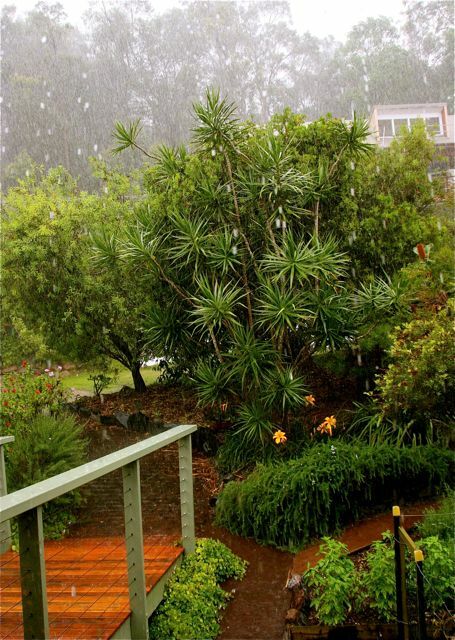 If you strain your eyes you can see the hail falling. I managed to grab a ball before it completely melted but it was as big as a golf ball when I picked it up. The very next day we had a whopping storm. 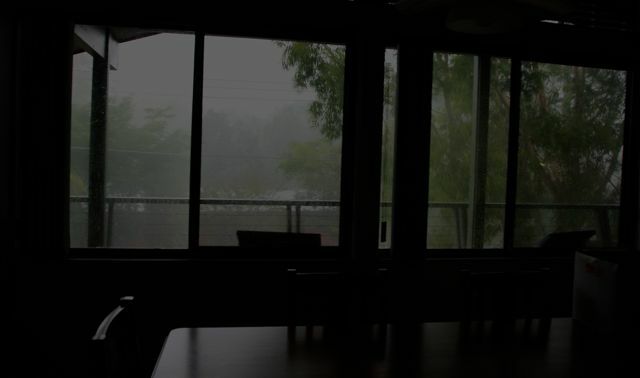 At 1:00 in the afternoon the sky grew so dark that the street lights and our garden lights automatically turned on. The sky was scary and you can see how dark it was inside. Everyone in the street had their lights on. On the news I heard there were 35,000 lightning strikes in Brisbane. I have increased the exposure so that you can see the rain. It was coming down in torrents. The gutters had no chance of coping. The garden paths and road became rivers. 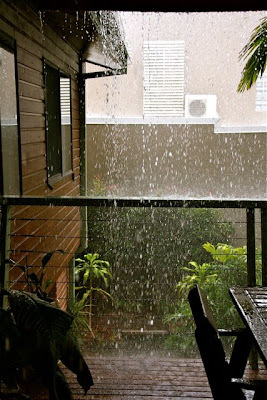 Our balcony was soaking. 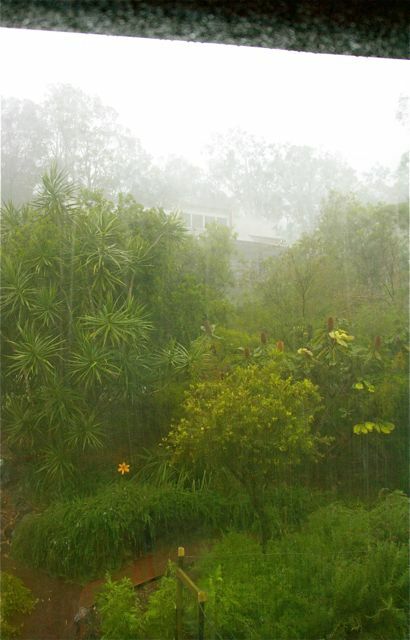 At the front and the back of the house I could hardly see beyond our garden. The rain was like a sheet of water. 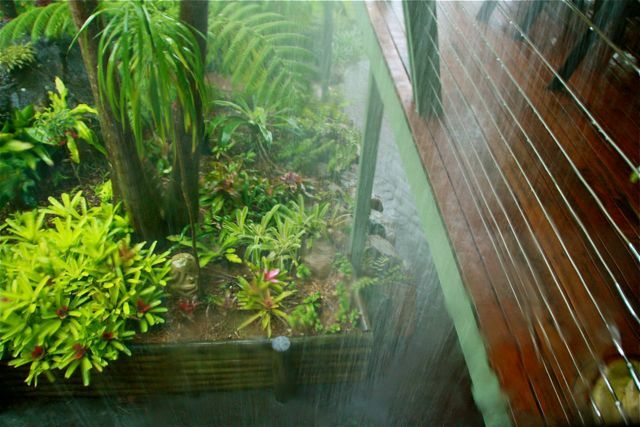 It reminded me of when I lived in the tropics in New Guinea. Today it hasn't stopped all day. We are lucky we live on the side of a hill and we don't get flooded like many other places around town. Some of the flowers I saw on our recent trip to Lake Eyre in South Australia. Christmas is a time to celebrate and we have been doing a little of that lately. Back in the 70's I belonged to a Playgroup. We still meet for a dinner twice a year and brag about our children and grand children. 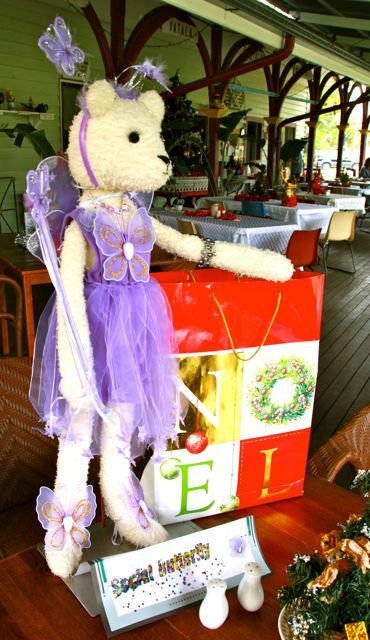 This is our Christmas get together at a boutique restaurant in the trendy suburb of New Farm. We had our own private little room. Unfortunately, there were quite a few members who couldn't make it this year. 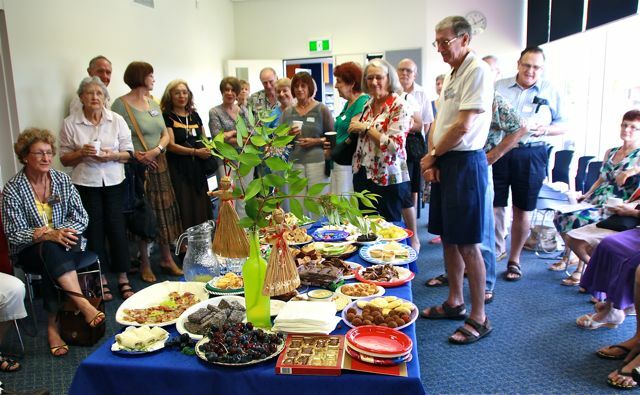 A new branch of the Brisbane U3A has just formed in our city of Logan. We belong to the camera club. This was a Christmas party for all the different groups: French, German, Spanish, Latin, English, Writing, Tai Che, Philosophy, Psychology, Silk painting, Painting, Bible Study, and Walking etc. The coordinator was giving us a talk. It was held in a meeting room in our local Library free of charge. 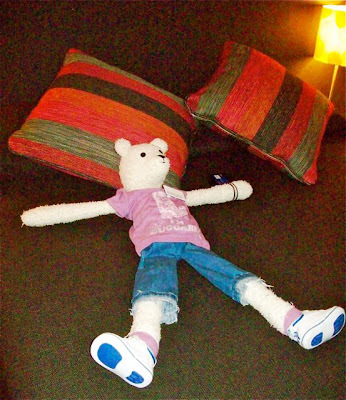 Then Birthday Bear insisted on a Christmas party for her group of wrinkly friends. 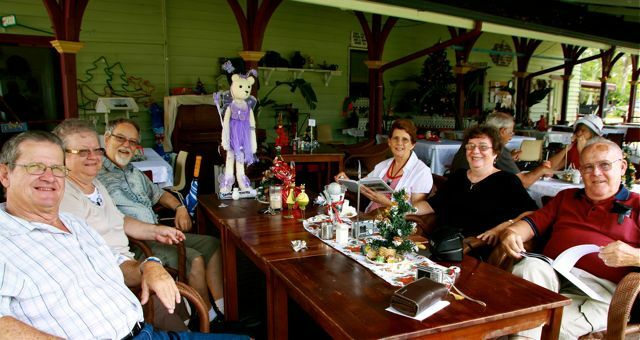 We went to a cafe in a historical village, museum in Beenleigh. The cafe was on an old railway station. We are sitting with friends Bill and Ruve (at the end of the table), who we met on a wine tour. They introduced us to the Camera Club. 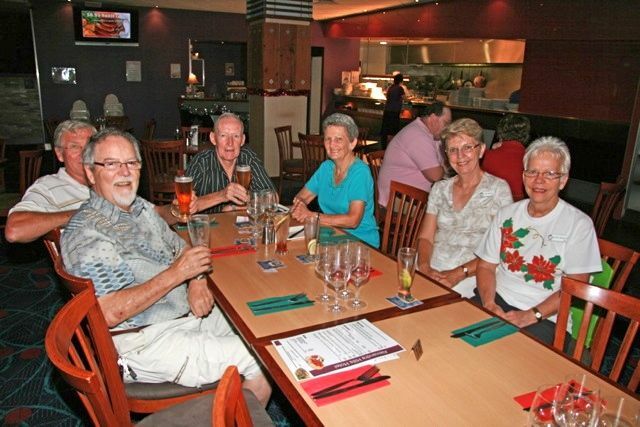 The other couple Sue(next to me) and Peter (hidden behind Bill), happen to be on the same tour as us to Lake Eyre. We bumped into them at Adelaide airport at the start of the trip. What a coincidence! Four parties in 2 weeks not bad for oldies. 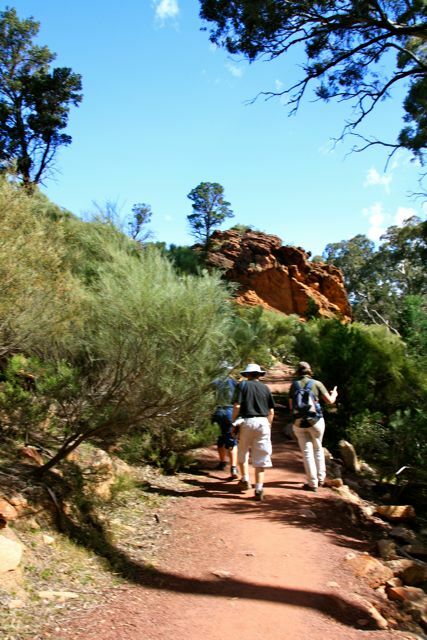 We left Burra and arrived back in Adelaide a few hours later. Our tour was over except for a farewell dinner and a night's stay in the Stamford Hotel. Adelaide is the capital city of South Australia but one of the smaller capitals in the country. 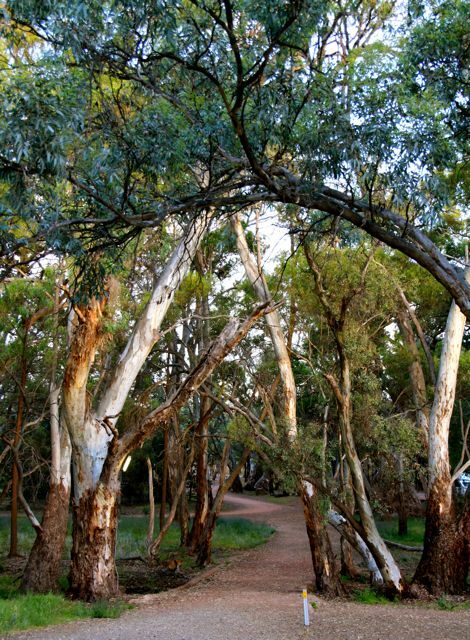 It has an interesting history in that there were never any convicts sent to Adelaide. It was a planned city for free settlers. It was planned before any Europeans lived there by Colonel William Light in 1836. 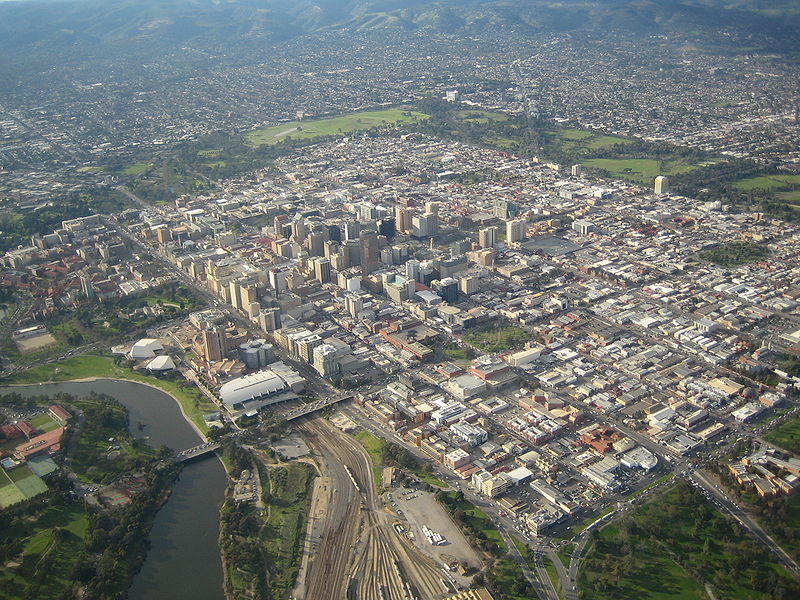 He arranged Adelaide on a grid with wide roads and surrounded by parklands, as you can see below in this photo from the net. 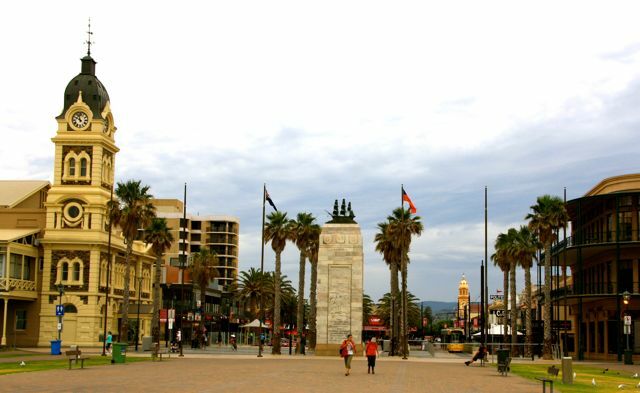 Adelaide was known for its churches and parks but now it is known for its arts and festivals. 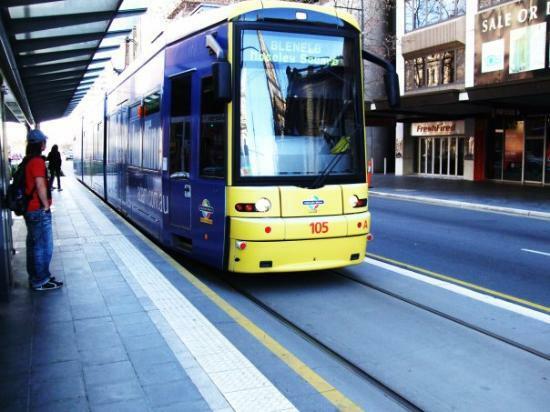 The next morning we went exploring by tram as our flight home didn't leave until after lunch. 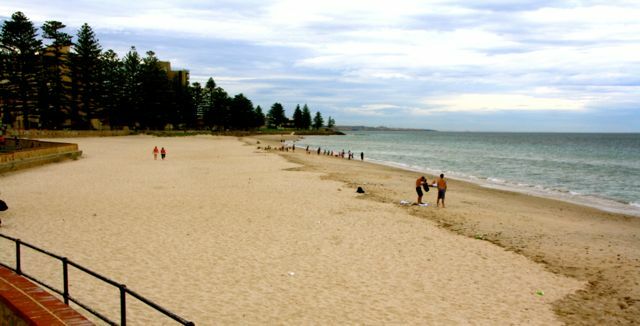 We ended up at Glenelg Beach. The suburbs have now reached the coast of Gulf St Vincent. As it is a gulf it is not a surfing beach but it doesn't stop them having fun. It was the last week of school before the summer holidays and there were many school kids on excursions to the beach. The weather was overcast but very warm. 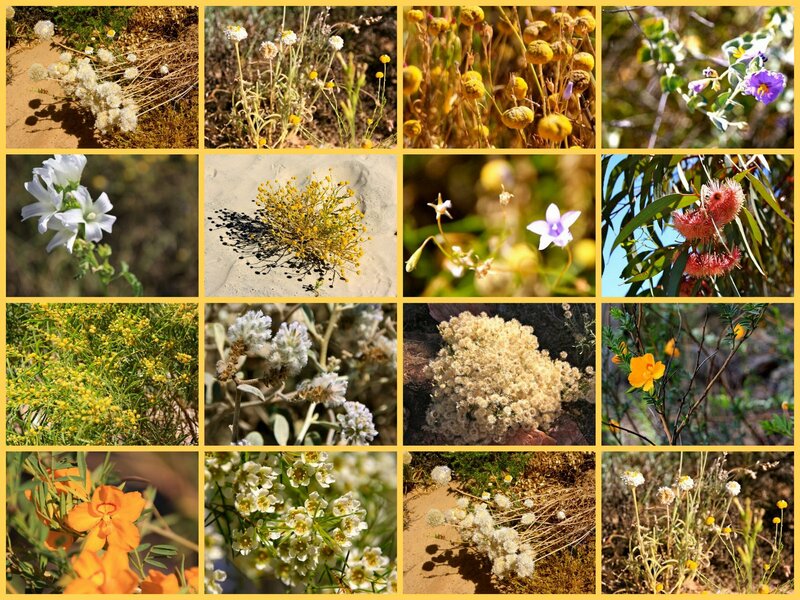 It gets very hot in summer and quite cold in winter. It is a calm, clean, liveable city with only just over one million people. We had a coffee and said goodbye to our friends who were on a later flight and headed back to the city. They have a few pigs in the mall. They are very good sculptures in all different poses. One has his front trotters standing up on the edge of a rubbish bin, with his snout in the bin. AND SO ENDS ANOTHER ADVENTURE. 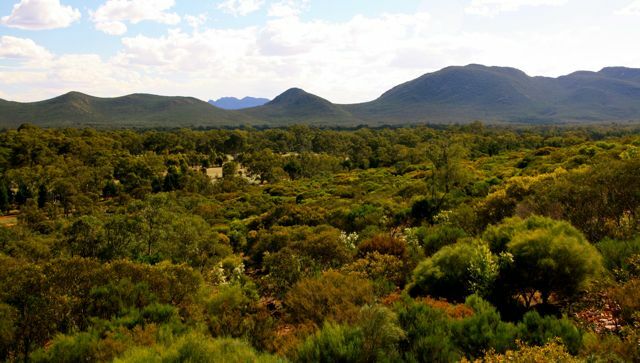 After our walk into Wilpena Pound, we returned to the resort and booked a scenic flight over the pound for the next morning before we were to leave for Adelaide. Our accommodation, which was very comfortable. However, when we awoke the next day, there were clouds hanging in the trees and hiding the mountains. It wasn't long before the pilots arrived to tell us that the flights had been cancelled as we wouldn't see anything but cloud. We were refunded the money. 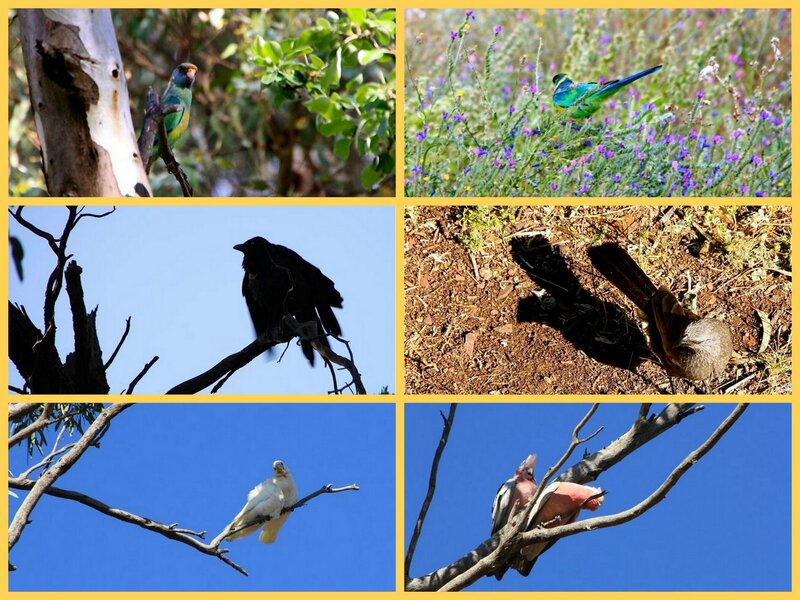 Instead we went for a walk to the Visitor Centre and saw colourful birds and flowers on the way. (a future post) It was a lovely place to stay and I would have liked a few more days there. 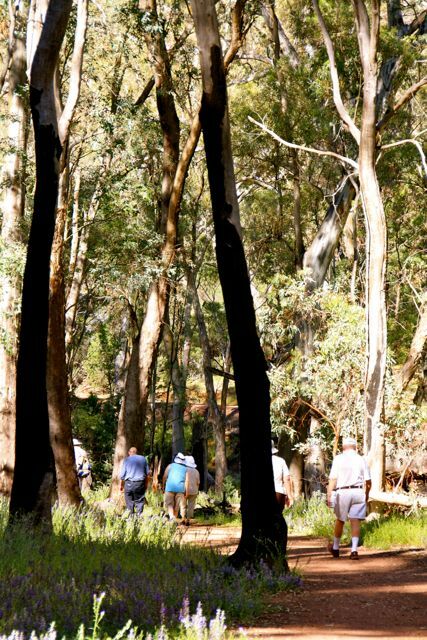 We pulled into another historic ghost town, Terowie. 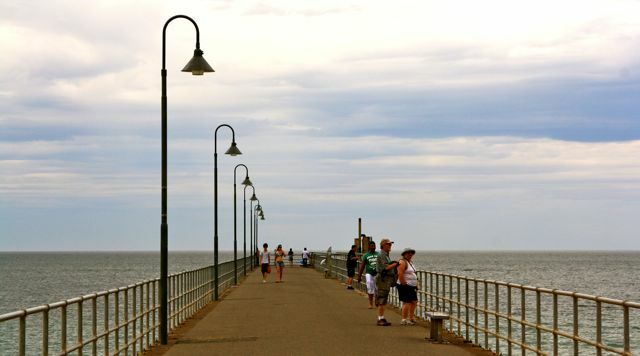 It was established in the late 19th century as a railway junction for NSW and SA lines. There were large rail workshops and a population of 2000. 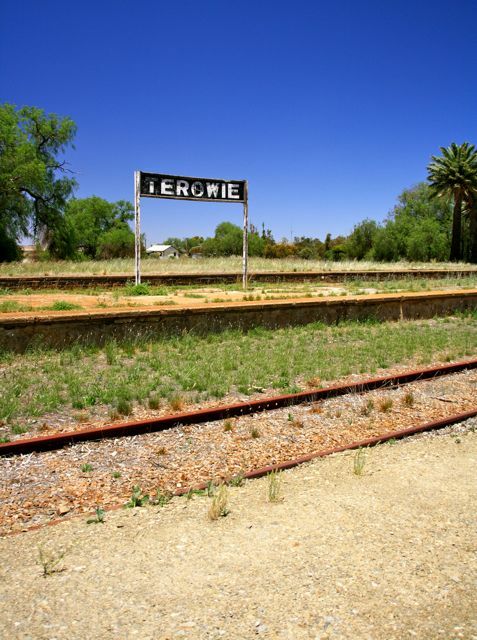 The tracks of the two different states were different gauges and people had to change trains at Terowie. In 1969 the gauge became standard and the trains no longer needed to stop here. The farmers in the area were hit by continual drought and a rabbit plague and so the town started to die. In 1980 the railway was moved away altogether and took away what the town lived for. 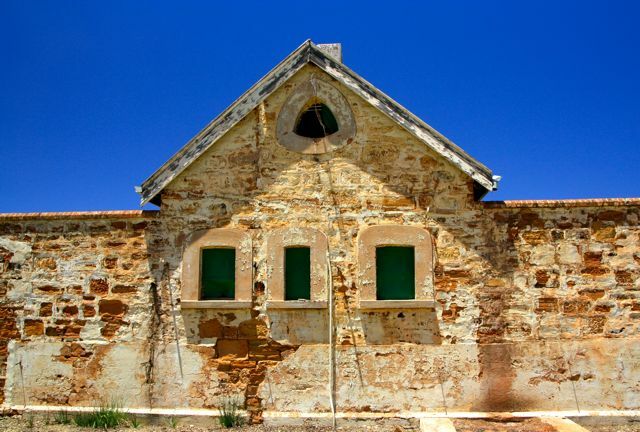 However, it has one of the best collections of untouched 19th century buildings. Its big claim to fame is that during the war there was an army camp there. When General Douglas MacArthur was changing trains from Darwin on his way south, he gave his first Australian press conference on the station uttering the famous words,"I came out of Bataan and I shall return." 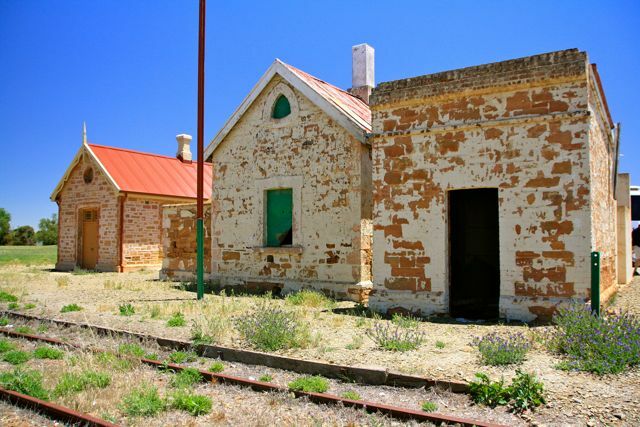 Then we drove on further south and stopped at a historic mining town, Burra, which is still thriving today on tourism. It so happens that I have an old friend living in this far away place. We used to room together when we were at teachers' college. 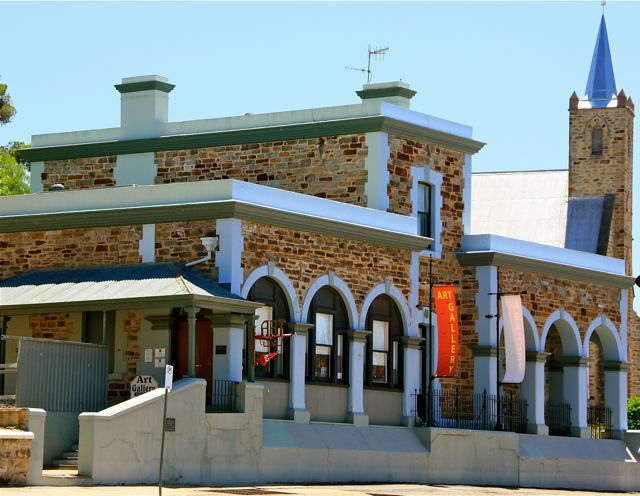 Her home is the oldest hotel building in Australia that has not had the original floor plan altered. It was fun to catch up with her even if it was for only half an hour. 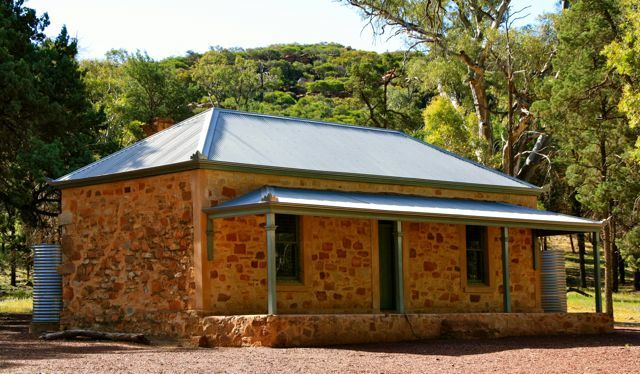 Burra is a fascinating historical copper mining town with many wonderful buildings to see. Unfortunately, we were not there long enough. 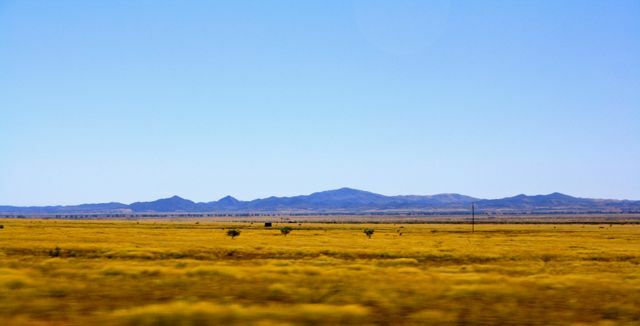 We were soon whizzing along past many more farms on our way to Adelaide, the capital of South Australia. 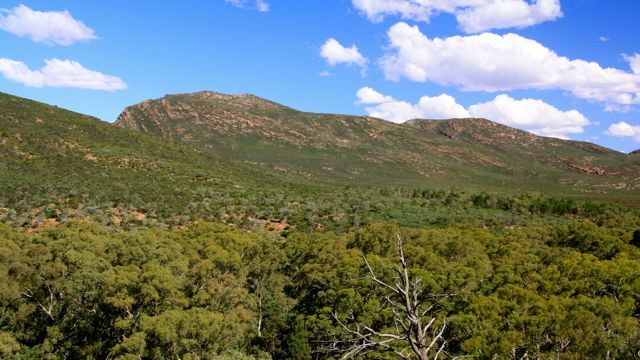 Wilpena Pound is an unusual oval shaped mountain range forming a natural amphitheatre in the Flinders Ranges in South Australia. It is not an old volcano but natural mountain ranges. Two running north and south and two running east to west. They were formed by folding, like when you put your hands on a tablecloth and push them together. 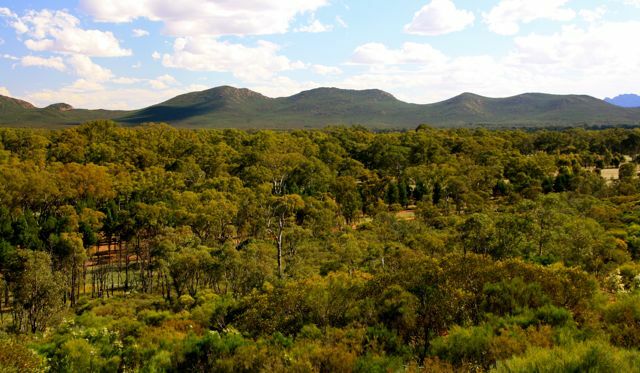 The name Wilpena is said to be an aboriginal word for "place of bent fingers". No one is sure if it means it is shaped like the palm of your hand with bent up fingers or if it means what you do with your fingers when it is freezing cold, as it gets here in winter. This is a photo of a poster on the wall of the Resort Reception. We were to fly over it the next morning but it was totally covered in cloud so the flight was cancelled. However we enjoyed a walk into the pound through the only gorge that drains the pound. 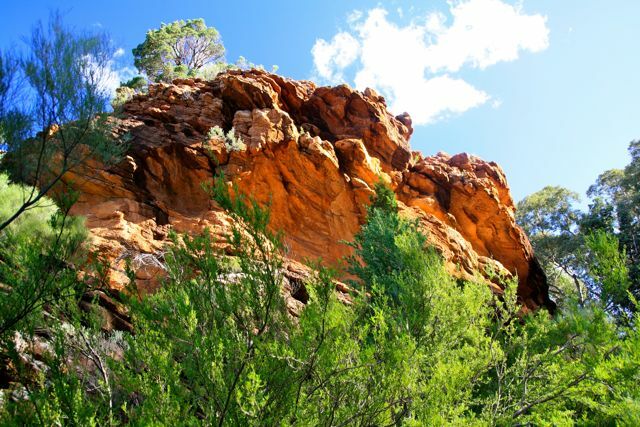 The rock formations were so colourful. In the early 20th century farming was attempted in the pound. Animals didn't need to be fenced other than across the entrance gorge. However, the venture failed after the homestead was washed down the gorge in a flood. This is a replica of the original homestead. Inside the pound we climbed up, up to a lookout over the floor of the pound. It was huge and breath taking, My wide angle lens couldn't get it all in at once. I had to rotate taking 6 panoramic shots to get it all. Here are 3 of them. It didn't matter which way you looked you were surrounded. Then it was back down and through the gorge to the resort. It had been a fabulous day. Birthday Bear was exhausted too and enjoyed the comfortable room.